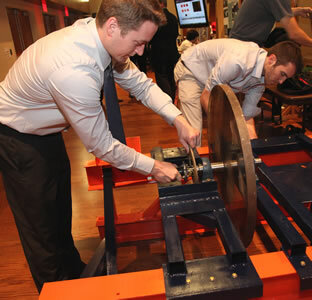 UTSA engineering students showcase innovations at a technology symposium. (Jan. 29, 2014) -- After a five-year pilot project, The University of Texas at San Antonio (UTSA) College of Engineering has seen measurable improvements in the retention rate and grade point average of students who participated in a freshman seminar course called Just in Time Math (JITM) created by curriculum experts within the college's Center for Excellence in Engineering Education. In 2009, the UTSA College of Engineering introduced a new math sequence to the undergraduate engineering curriculum aimed at shortening the time it takes students to begin taking engineering core courses. The Just in Time Math seminar course exposes first-year students to lab experience and math topics most heavily used in core engineering courses such as statics, dynamics and electrical circuits. Additionally, engineering applications have been incorporated into traditional calculus so that students are prepared to take core engineering courses up to a year earlier than in the traditional degree plan. "For decades, the traditional math sequence has required students to take up to three or four semesters of math prerequisites before they can enroll in introductory engineering courses," said Mehdi Shadaram, Briscoe Distinguished Professor and interim dean of the UTSA College of Engineering. "During this period, students have no significant interaction with the engineering faculty, and engineering schools suffer egregious retention problems. In just five years of revamping our curriculum, we have seen more enthusiasm about engineering among the students and substantial improvements in retention and graduation rates." The college has offered the Just in Time Math seminar to cohorts of approximately 25 engineering freshmen every fall on a voluntary basis since 2009. At the conclusion of this five-year study, the data shows that on average, the retention rate of the project cohort was approximately 20 percent higher each year than the traditional cohort. In the first year, the GPA of the project cohort was 55 percent higher than the traditional cohort, and over the next three years, it was an average of 12 percent higher. "JITM offered more in-depth teaching of introductory vector calculus and differential equation solving, so that I felt prepared to do this sort of math in my basic engineering courses," said UTSA mechanical engineering senior Peter Mancuso. "Also, it got me on track to finish in four years. I would say its personal profound effect was that I could take courses simultaneously, rather than as prerequisites, and taking JITM at the start of college boosted my skills in all my engineering coursework." Ultimately, the curriculum changes shift the traditional emphasis on math prerequisite requirements to an emphasis on engineering motivation for math. The UTSA College of Engineering is one of roughly two dozen universities across the country dedicated to creating a new national model for engineering mathematics education. Support for these curriculum changes was provided initially from the National Science Foundation through a sub-agreement with Wright State University. Continued funding has been provided by the University of Texas System and the U.S. Department of Education. The Center for Excellence in Engineering Education provides a holistic approach for improving the quality of engineering education at UTSA. The center strives to improve the preparedness and marketability of the students in the College of Engineering for challenging and rewarding careers. >> Learn more about the UTSA College of Engineering. The University of Texas at San Antonio is an emerging Tier One research institution specializing in health, energy, security, sustainability, and human and social development. With nearly 29,000 students, it is the largest university in the San Antonio metropolitan region. UTSA advances knowledge through research and discovery, teaching and learning, community engagement and public service. The university embraces multicultural traditions and serves as a center for intellectual and creative resources as well as a catalyst for socioeconomic development and the commercialization of intellectual property -- for Texas, the nation and the world.